After we told our neighbor we were planning to construct a rain garden, she asked us whether it would have any floating aquatic plants. We said, “Oh, no, it’s not going to hold water. It will fill up after a rain but then the water will seep into the ground within 48 hours.” Then she asked us if we were planning to keep fish in it. I wasn’t surprised to hear this, though, because not a lot of people are familiar with the concept of stormwater management. I’ve worked for Stormwater Maintenance and Consulting for a number of years, looking at plans, inspecting facilities, writing up reports and estimating repairs. For this particular home project, that experience was certainly helpful, but not all necessary. Any homeowner who wants to do a bit of research, and can wield a shovel can design and construct one themselves. We have a small yard, but the downspout just happened to empty onto a 25′ x 5′ section of grass that is separated from the rest of the yard by a sidewalk. The first step was to dig a test pit. This meant digging a 1′ x 1′ x 1′ hole and filling it with water. All we had to do after that was check on it to see if the water infiltrated within 24 hours, and luckily ours did. This meant our soil was not too compacted, nor too “clayey” to allow water to infiltrate. Then my husband and I ripped out all the turf in order to dig a shallow basin that will receive the water from our roof (as well as part of our neighbor’s since we live in attached housing and her roof slopes toward ours). This was tiring but gleeful work because we knew we NEVER wanted to mow that useless patch of grass again! 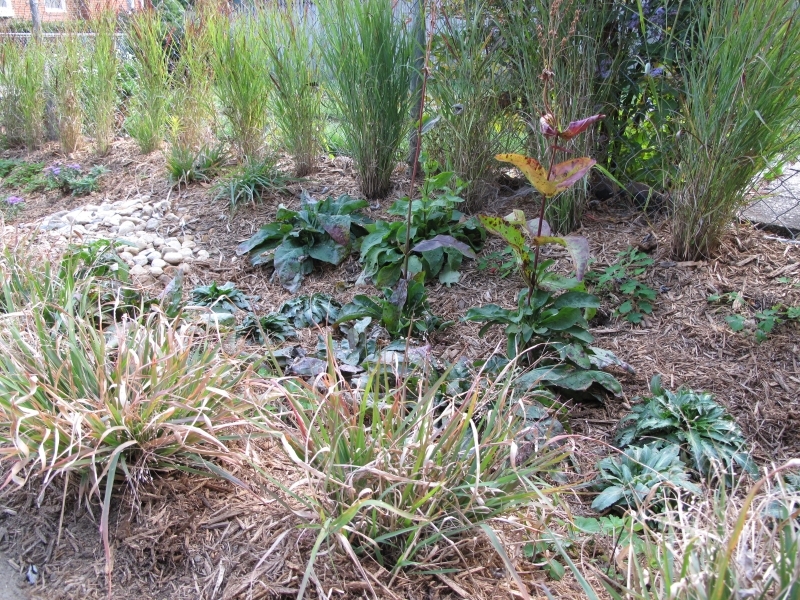 After the basin was dug out and mulched, we planted the landscaping which included tall grasses in the back and short grasses to border the front. We chose to install a lot of flowers for color throughout the spring, summer and even into the fall. There are also a few shrubs that will have bright red berries in the winter. 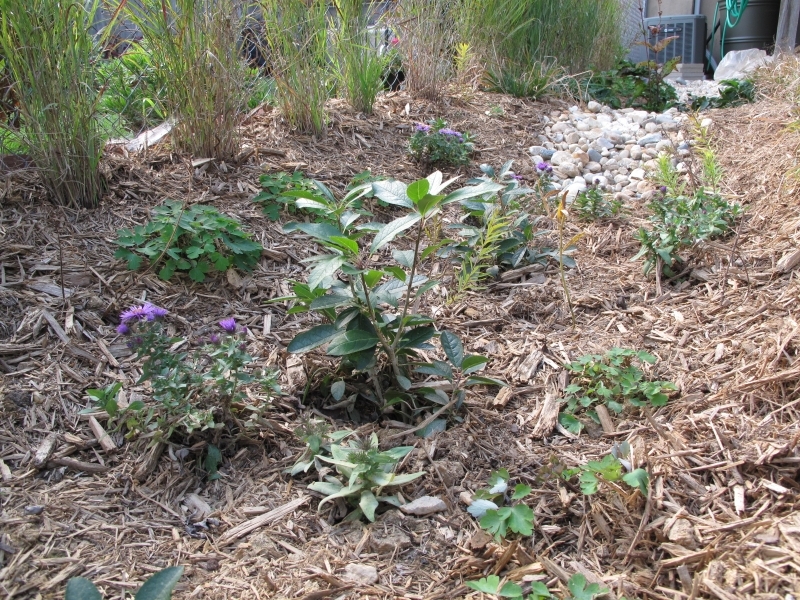 So, what are some of the benefits of building a rain garden? Beautiful, low maintenance landscaping – A rain garden is full of hearty, typically native, perennials, that can handle both wet and dry conditions. Native plants help native species – In particular, the plants we purchased have been inundated by monarch butterfly larvae, who attached their chrysalises to them. Reducing our stormwater footprint – Stormwater that runs off of hard surfaces such as our roof, sidewalk, and parking pad, flows to the alleyway picking up pollutants as well as contributing to huge spikes in volume in nearby streams. By keeping some of our runoff on site and letting it slowly seep into the water table, we’re doing our part to reduce erosion and pollution effecting Herring Run, the Back River, and the Chesapeake Bay. In some areas, large rain events also contribute to sewage overflows, which, in case you didn’t know, means raw sewage ends up in waterways – toilet paper and all. And, as already mentioned… less mowing! 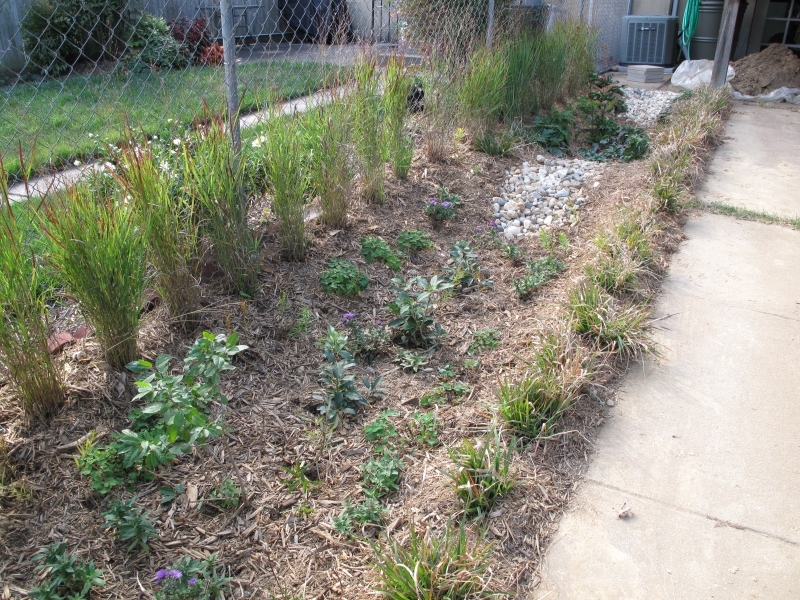 We’ve already seen our rain garden perform admirably in a 1.3 inch rain event. It was completely full, and had even overflowed (exactly it was designed it to), and within 24 hours the pool of water had soaked into the ground. The plants are flourishing so far, and I can’t wait to see them – and photograph them – flowering next year. This entry was posted in Landscape Architecture, Stormwater Management. Bookmark the permalink. Thanks for the post and the pictures. I love that you fit the rain garden into such a small space. Goes to show everyone that you don’t need much room to infiltrate a good amount of stormwater. Great idea about the perc test… it saved you a bunch of labor since you didn’t have to augment your soils. Great job! What do you do if you find too much clay in your soil?